You find yourself staring into the glowing eyes of a Helghast. Undead creatures will often be depicted as having glowing eyes, usually without any explanation. Then again, in magic-based undead this might either be the glow of the animating magic or magical eyes, created specifically to allow undead to see posthumously. It could be explained as the only visible part of the soul that inhabits the rotting body. Ones that do not actually have eyes, like reanimated skeletons and incorporeal ghosts, will often have glowing lights where the eyes would be. Occasionally, it will be twin ghost-fires burning in the sockets. It is by no means a universal trait of undead. Should Undeath end and the glow fade, it's Eye Lights Out. Compare Glowing Eyes of Doom, Hitodama Light (the undead are/have balls of flame), Ghostly Gape (often paired with Glowing Eyelights for pinprick eyelights in gaping black hollows). All vampires and ghouls in Hellsing OVAs have eyes that glow either occasionally or constantly depending on the character. Alucard, the protagonist is especially prone of this, and his eyes often seem like lamps in dark conditions. The vampire eyes glow red or blue, while the ghouls settle for purple. In Fullmetal Alchemist, Alphonse is a character whose soul has been bonded to an empty suit of armor, yet the eye holes in the suit glow a pinkish color. Later the brothers encounter others of the same condition who also have glowing eyes. This seems to only be visible to the audience, as if they are "asleep", the characters don't notice. Berserk: Both the Skull Knight and his ghastly horse are creatures of the undead, with dark, cavernous eye sockets lit by glowing eyes. The skeletons animated by the evil spirits attracted to Guts' Brand in volume 1 are the same way. In Soul Eater, Sid, who is a zombie, has these. Wise Man of the "Chronicles of Nemesis" arc, R season from the Sailor Moon manga and anime respectively. Lord Ains of Overlord has glowing red pinpoints in his eye sockets, which occasionally flare into full red flames for dramatic effect. Marvel Universe: Swarm, the Nazi Made of Bees, is a borderline example, being a human skeleton moved around by a colony of telepathic bees with Nazi sympathies. His eye sockets glow brightly. Blackest Night: Most Black Lanterns had glowing points of red or white light in otherwise seemingly empty eye sockets. Raise the Dead has zombies whose eyes glow red. 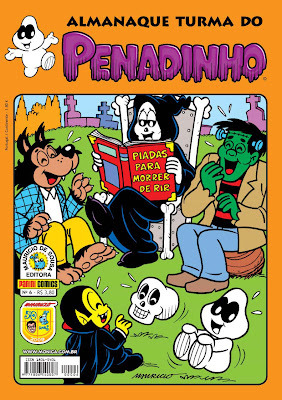 In Brazilian comic ◊ Bug-a-Booo, ghosts, skeletons and Lady McDeath have these. The Witch-King of Angmar, from the Animated Adaptation of The Return of the King. He also talks like Skeletor. It should be noted that the Witch-King's Glowing Eyelights of Undeath are accurate to the book. They are the only thing visible except his crown. The Last Unicorn has a talking skull that's usually quite silly and playful... until he recognizes a "UUUUU-NICOOOOOOORN!" In The Book of Life, the spirits have yellow ones. The vampires in the So Bad, It's Good vampire movie Innocent Blood. In several different colors, too. Salem's Lot, the film version always depicted the vampires this way. Bit more noticeable in the 2004 remake. Van Helsing: Aleera, one of Dracula's brides, is normally seen doing this. Pretty much every ghost in Ghostbusters (2016). Thor: Ragnarok: Fenris and the Berserkers have green-glowing eyes after Hela revives them with the Eternal Flame. The Helghast (plural) in the Lone Wolf gamebook series, as shown with the image above. Note that they are shapeshifters, and thus their eyes don't glow while in human form, as it would give them away. (The glow may be a side effect of the psychic attack that a Helghast is trying to melt your brain with...) Most other undead in the series avert this. The skeletal Vordaks still have human eyeballs, while some zombies either have eyes or just rotting eye sockets. In Stephen King's It, the eponymous monster's true form glows with "the deadlights", which can be a deadly Brown Note when viewed directly. Ghost dogs with glowing eyes attack a gangster's former home every other night in the Nancy Drew novel Ghost Dogs of Moon Lake. In the Goosebumps book The Ghost Next Door, Danny's ghost in the Shadow World chases Hannah, red eyes glowing. Discworld's Death, only with blue lights. They turned red once in Mort when he was enraged. The Greater Dead in Garth Nix's Old Kingdom trilogy have fiery pits for eyes; some of the more powerful Lesser Dead demonstrate this as well. Necromancers have a lesser version of this (physical eyes are still there, but they're described as burning), depending on how long they've been using Free Magic. The Ringwraiths are sometimes depicted with eyelights, which "glow with a hellish fire" when they're angry. The Barrow-wights had the same effect. Rather chilling, since it's the only feature Frodo's actually able to make out. Bob the Skull in The Dresden Files. More precisely, Bob is the glowing eyelights — he's an air spirit that looks like a cloud of glimmering motes that happens to live in a skull, rather than an undead being. In The Laundry Files by Charles Stross, infection by one of the gibbering extradimensional horrors the Laundry fights against is marked by eyes full of what appear to be glowing, seething worms. In Simon R. Green's Nightside series, Merlin Satanspawn has empty eye sockets filled with flames. He's the Devil's son, and every time these eyes are mentioned it's commented that "he has his father's eyes". He's first met as an undead, but when his live version is encountered (while time traveling to the era of Arthurian Legend in Paths Not Taken) he already has the freaky flaming eye-sockets. The Stalkers in Philip Reeve's Mortal Engines, being Cyborg-zombie Super Soldiers, have their eyes replaced with green lights. In A Song of Ice and Fire, people and animals killed and raised by the Others have their eyes turned a bright, cold blue, which can then glow when they're being particularly active in undeath. The Others themselves have similarly coloured eyes, but their undead status is both highly questionable and very unlikely. As well as this, people resurrected by the magic of R'hllor, though not conventionally undead, have a distinct red glow in their eyes at times. Any people possibly resurrected by the Drowned God? No glowing observed in Patchface, as yet. Creepily vacant, though. The title Jedi ghost of Galaxy of Fear: Ghost of the Jedi first appears, when Tash can see him clearly, with empty eyes. As she talks to him and needs his help a flicker of light comes to them, strengthening to a steady glow. Eddie, the undead mascot of british heavy metal band Iron Maiden, has semi-skeletal facial features and empty eye sockets with this trope in full display. Sometimes his eyelights are flames, sometimes lightning, occasionally something else, but they're present in almost every appearance of the character from album art to merchandise to the huge animatronic stage puppets appearing on tour. The zombie gorillas in the video for the Gorillaz song "Clint Eastwood" have glowing red eyelights and apparently no eyeballs (as can be seen when one of them disintegrates). They otherwise look just like living gorillas, except for having blue fur for some reason. The eyes of the undead troops in the video for Raubtier's Achtung Panzer glow red as they rise, as do those of the zombie tankers. They seem to glow the same colour as the tanks' headlamps. The jikininki of Japanese folklore, who are said to be the ghosts of self-centered or impious people, have glowing eyes. Bone Busters has One-Eye, a disembodied skull who taunts the player, and his one remaining eyeball glows. Elvira and the Party Monsters has a laughing skull with glowing green eyes which is used to lock the player's pinballs. Liches have "pinpoints of light" in their empty eye sockets and archliches (non-evil variant lich) have twinkling lights. Alhoon (illithid liches), however, look much like in life, but with dried skin. Of Forgotten Realms undead, baneliches got burning red pinpoints of light and baelnorns (lich-like elven guardian undead) have glowing white eyes. A subversion with Mystara's "dusanu": this monster looks like a typical rotting skeleton... but in fact it isn't undead but a fungal colony that had taken over a corpse. The haunting blue lights coming from its eyes sockets are in fact caused by the waste fumes of the fungus. In Vampire: The Masquerade, one of the early powers vampires can gain in the Protean (shapeshifting) discipline allows them to see in the dark while making their eyes glow red. 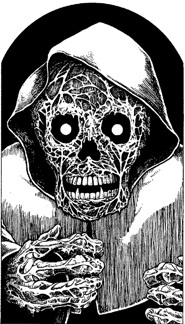 Warhammer: According to the associated literature (such as Nagash The Sorcerer), animated skeletons have this. Zombicide artwork depicts zombies like this. Trauma Towers, a funhouse based at Pleasure Beach Blackpool in England, contains vampire children with glowing eyes. Disneyland's The Haunted Mansion used to have "Emily", the ghost bride. Until somewhere in the 80's, all the versions of the character had glowing light-yellow eyes blazing through the darkness of the haunted attic, paired with a glowing, beating red heart. The 70's Bride's face was actually pitch black with only the two glowing eyes. However, the later, more realistic design had more normal-looking eyes (except in Tokyo Disneyland, where the Bride's eyes, though with a visible pupil, still glow a bit). The current bride ghost, Constance, who replaced Emily, does not glow at all. Other, less notable ghost's eyes also glow, most notably some shrouded spooks visible in the Crypts of the Graveyard Jamboree scene. All the infected in Left 4 Dead. This is clearest in the case of the Witch. The Witch is the only one to technically have glowing eyes. All the others simply have untextured eyes, leaving blank and white. Many, but not all undead in the Heroes of Might and Magic games have them. Dry Bones, the skeletal undead versions of Koopas. Dry Bowser also applies. Kingfin in Super Mario Galaxy, although surprisingly not the standard undead enemies. Said boss also has an even more extreme case of this, because the eyes seem to shoot light beams in the direction it's looking. Raziel in Legacy of Kain, in cutscenes. It's not properly rendered ingame until Defiance. Most of the Forsaken undead have this, though there are some Forsaken facial textures that don't include glowing eyes. They have empty eyesockets instead. Also undead of the Scourge and the Lich King as shown in the trailer/opening cinematic for Wrath of the Lich King. The blue glow isn't limited to their eyes, but also appears elsewhere inside the skeletal undead. And as former members of the Scourge, Death Knights of all races. If the regular members of the race already have glowing eyes (such as night elves), then it's more visibly pronounced for death knights. Also the color will change, as the night elves' normal yellow and blood elves' normal green will be switched to the same blue as all others. The hollow men in Fable II have them. They're corpses animated by glowing sprites called wisps that dive into the ground and pull up the corpses. The Hero's Shade in The Legend of Zelda: Twilight Princess is a skeletal one-eyed variation. Stallord also has glowing pale-pink eyes. Similarly, the Stalchildren from Ocarina of Time and Majora's Mask also have red lights for eyes. Lanaryu, from Skyward Sword. When Link meets him in the present time, he's little more than a decaying skull surrounded by the rotting rather, rusting remains of his helpers. Attempts to communicate with him result in his empty sockets lighting with a sickly yellow. You get the chance to change that, however. The Stalfos and Staldra enemies also have glowing eyes. When a Staldra's eyes turn from blue to red, it's time to get your shield ready. The Stal- version of enemies in The Legend of Zelda: Breath of the Wild all have glowing eyes. Dead Rising zombies have eyes that glow red at night, when their strength drastically increases. The reaper man in Shadowgate is an otherwise unremarkable example, but his position in the Game Over screen means that players will spend a significant fraction of their time looking at him. Many demons in Doom 3 have eyes that glow red, orange or blue that is, if they have eyes.. Both Skeleton T and Oshare Bones from Puyo Puyo have this. However, with Oshare, it only occurs in his left eye; his right eye is a case of The Dead Have Eyes. Jericho Cross of Dark Watch has only one eye, the other marred by a nasty scar. The scar begins to glow red when he is turned into a vampire. The Sorrow in Metal Gear Solid 3: Snake Eater has glowing red eyes when he first appears as a ghost behind The Boss. Mr. Tall of Amnesia: The Dark Descent has green eyelights, if you look closely enough. All of the zombies in Call of Duty: Zombies have yellow-orange lights in their eye sockets. Zombie!George Romero eyes glow when he's in berserk mode. All ways of becoming a husk involved dying, or at least ceasing to be a living human, in Mass Effect, so they probably qualify. Fallout 4's feral ghouls, though more Technically Living Zombie than truly undead, have glowing yellow eyes that make them especially creepy in dimly lit areas and the first strain of their species with this particular trait in the entire Fallout universe. All zombie-esques with intelligence in Sonny, the free online Flash RPG series. Most Undead characters in Dark Souls look perfectly normal, but those that have given up their humanity and turned Hollow have emaciated faces and glowing red eyes. The Draugr from The Elder Scrolls V: Skyrim have this, and they go out when they die. Zombies have red, glowing eyes in Sniper Elite: Nazi Zombie Army. From a gameplay perspective, this is likely to increase their visibility in the game's dark, dreary, and extremely foggy environments. Hell, it even helps you pick out their heads, which is handy for Removing the Head or Destroying the Brain purposes. Penumbra: Overture's zombie dogs have an inexplicable green glow to their eyes. The Witch's House: The Witch displays these if she catches you, due to having no eyes. What makes it worse is that she also has no legs — making a loud SQUELCH noise every time she drags herself closer — and she's only 13. The indie horror game Black Rose has a ghost that stalks you at three different points throughout the game. A note found in the cellar tells the player not to look into the eyes. Looking into the ghost's eyes for too long will get you killed. In Zack & Wiki: Quest for Barbaros' Treasure, Bonelich von Skeleski, when wearing the red or blue powdered wigs, gets matching-colored glowing eyes. The Broken Lords of Endless Legend mix the glowing eyes of undeath with Glowing Mechanical Eyes. Their society was forced to bind their souls to suits of Animated Armor, which glows with an inner blue Dust light, causing their eyes holes and mouths to glow. As an ambulatory skeleton, Sans of Undertale has these. This actually gives him a more friendly and cheerful appearance, because he looks downright unsettling without them. Oddly, his brother Papyrus does not have these, mostly having empty but very expressive eye sockets with the occasional expression revealing he has eyeballs (he'd look somewhat creepy if he did). The morose ghost Napstablook also has these. Quest for Glory I: The gatekeeper for Baba Yaga's hut is a talking skull who complains that he lacks these. The other skulls on the fence were given glowing gems, and he was left out. The hero must find a gem for him before the gate will open. Despite not having any particular powers mentioned other than glowing, the gem does allow the skull to see. Naruto Shippuden: Ultimate Ninja Storm 3: when Kabuto Yakushi summons the resurrected Kakuzu, Itachi and Deidara, their eyes are glowing. Darkest Dungeon has the Collector, whose collected heads have a ghastly blue glow in their eyes. Which can't be good for said victims. Dying creates a Shade of the Knight at the location they were slain. In contrast to the Knight's white head with empty-looking black eyes, the Shade has a black body with round, solid white eyes. The Sibling Shades at the bottom of the Abyss have the same kind of look, but with a more pronounced glow. Bugs who have become Husks (i.e. zombies) as a result of the Radiance's Infection have glowing yellow-orange eyes. Undead in Dan and Mab's Furry Adventures have solid black eyes with glowing yellow pupils. "..." in Hanna Is Not a Boy's Name has glowing orange eyes. Looking for Group: Maikos and Richard — Yellow for Richard, Red for Maikos. Xykon, as a D&D lich, has glowy red lights where his eyes should be. Also the case with the three Xykon decoys during the battle of Azure City: a Death Knight, a Huecuva and an Eye of Fear and Flame. The bone golem made from Roy's body has green eyelights. Anti-Heroes, another D&D-inspired Stick-Figure Comic, has Finx the lich. His design is quite similar to Xykon, but he's a lot less scary. In The Zombie Hunters, all classes of The Undead have black sclerae with glowing white irises, excepting the Basilisk, a class with a paralyzing gaze and bioluminescent red irises. Charlie, a partially revived zombie restored to sentience, has one undead eye, which he hides with a contact lens. Justified in Unsounded: the undead Duane sees with enchanted glass eyes; the glow in their sockets is a side effect of the spellwork that links them to his sense of vision. Seems to be a sign of intelligent undead in Our Little Adventure: creatures like the farmstead wights , the forest wraith , and the Bone have them, but mindless skeletons and zombies don't. The formerly human zeds of Zombie Ranch are distinguished by glowing red eyes. Animal zombies shown seem to lack this feature so far. In the defunct tgchan adventure Bug Castle: The Broken Slumber, Revenant Zombie bugs have empty eye sockets with lights in the color of their spirit. By contrast, living moth priest Shatiki has eyes with grey sclerae, black pupils and specular highlights. Zombies in Undead Friend, have large empty black sockets and red glowing pupils. Danny Fenton/Phantom's eyes glow when he goes ghost. Most ghosts in the series also have eyes that glow, sometimes only when they use their powers. He-Man and the Masters of the Universe (2002): Although he isn't undead, Skeletor has no soft tissues above his collarbones. He pulled off the glowing eyes whenever he was really angry. The Lich from Adventure Time has a very, very faint pair of these, as does anyone else under his control. The Terrorcons of Transformers Prime have both this and Glowing Mechanical Eyes, being undead Mechanical Lifeforms. Some (like the one that used to be Cliffjumper) also get Throat Lights.